They say that breakfast is the most important meal of the day. I don't doubt there is truth in the statement but admit to not really being a breakfast person. I am even less so when the mornings are hot as they are invariably here in Pattaya, Thailand. That said, I live and travel on a budget and so look for value for money. Sometimes breakfast will be the only meal I have in a day. I don't stick solely to 'English' food and am as likely to eat Thai or Filipino food but for the purpose of this Hub I am sticking to 'English Type'. There were two reasons for my putting this report together. The first was to see just was on offer here from a cheap living point of view and secondly to experiment with my own eating habits and see if I was any fitter at the end of the day. 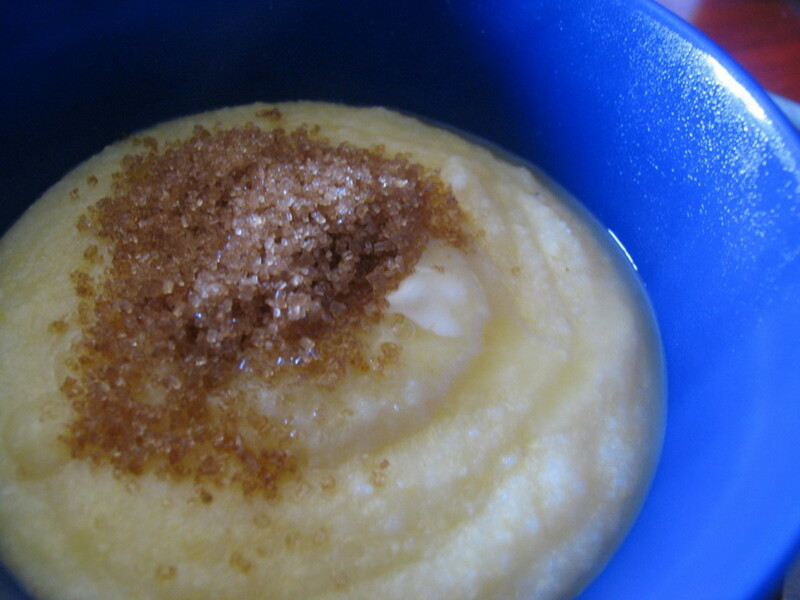 How to gauge a breakfast? For me this is an easy one. 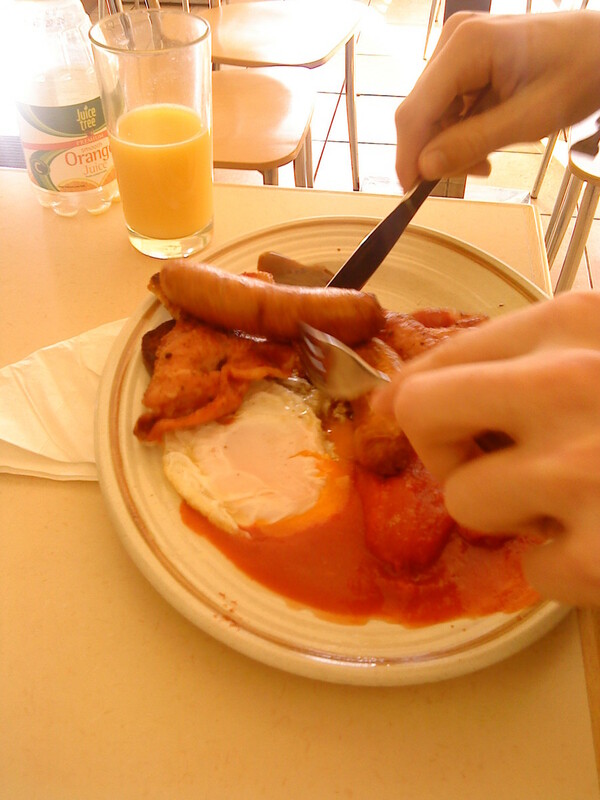 Without doubt the best value Full English is the 'Special' on offer at Adam's Cafe on the Askew Road in Hammersmith, London. This little cafe should be a place of pilgrimage for visitors to London and indeed it is to some. So here I am looking for quality, quantity, taste, presentation and value for money. I will photograph each breakfast and mark each out of 25 with 25 being the top mark. My aim is not to spend more than 100 Baht a meal. (I will consider 110 Baht if the meal looks worthwhile). 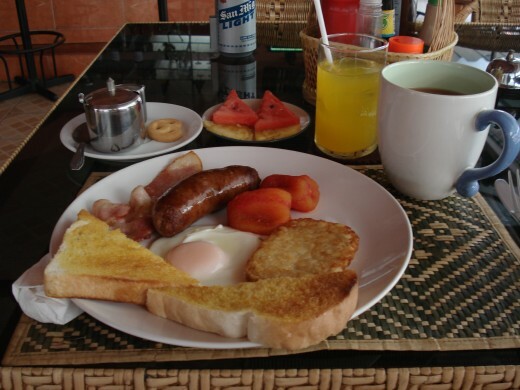 I have purposefully eaten two 'Full English' breakfasts priced at 140 Baht and one at 180 Baht. These offered nothing more in taste or quantity than those I have reviewed below. The exchange rate on the Thai Baht was calculated for the day I ate the meal. As of January 2011 this article is under review. Some establishments have closed, others have changed their menus or their prices. The 100 Baht per breakfast remains my criteria as to the establshment selected. I plan to remove those breakfasts which have crossed over the 100 Baht mark. Crazy Dave's is an institution in Pattaya. Situated on Soi Chaiyapoon just off Soi Bukhao it is so well known that virtually any motorcycle taxi would take you straight there. I have eaten there a time or two when I needed cheering up. 'Only Fools and Horses' runs on big screen TV here almost 24 hours a day. It is an open fronted 'fan' establishment and the whole place smells of cat piss but the staff are friendly. The breakfast consisted of two slices of toast with butter and marmalade. This accompanied 1 slice of fried bread, 2 fried eggs, 2 slices of bacon, 1 sausage, half a tomato and some baked beans. To wash it down was a large mug of tea (or choice of coffee). Seaside is also situated on Soi Chaiyapoon just a few doors up from Crazy Dave's. The restaurant is proudly 'English' but is popular with a wide range of nationalities and other than the breakfast has a full menu. Seating for eating is offered either outside, in a covered fan area or in air conditioning. The breakfast consisted of two slices of toast with butter and marmalade. This accompanied 1 glass of orange juice, 2 fried eggs, 2 slices of bacon, 1 sausage, a whole tomato and some fried potatoes. To wash it down was a large mug of tea (or choice of coffee). A nice touch was the scented wet towel handed to me at the end of the meal. The 18 Coins restaurant is situated on the ground floor of a guesthouse on Soi Bukhao. At the top of Soi Diana turn right and it is about fifty yards on your right. It is an open plan, fan establishment. It is immaculately clean and has pleasant, helpful very friendly staff. For some odd reason my camera failed and so I had to breakfast here on two days. I did not mind because it was very tasty the first time. From Soi Diana cross over Soi Bukhao and onto Soi Lenkee (Soi 25) . Walk up Soi Lenkee on the left hand side of the road as if headed to 3rd road. About halfway up you will come to the Valentine's Guesthouse. A neat and tidy establishment with friendly and efficient staff. The Thai Isaan Guesthouse is located on Soi Bukhao. Leave Second Road and up Soi Diana. Turn right at the top and head along in the direction of South Pattaya Road. Two thirds of the way along (7 minutes walk) is The Thai Isaan Guesthouse. It is a small plain looking establishment located between a laundry and the QD Apartments. The Thai Isaan Guesthouse is an open fronted fan restaurant. It is a clean, neat and tidy place with seating for perhaps thirty people both inside and outside. It serves both Thai and English food. 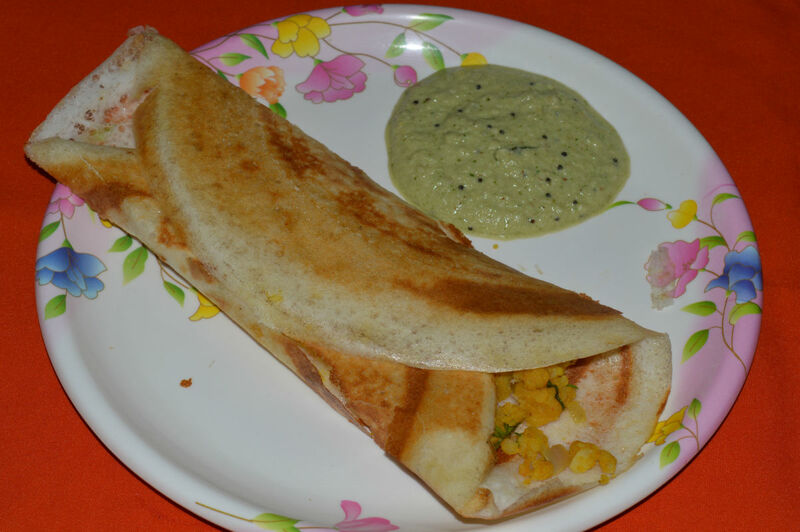 It has a comprehensive menu which has numerous photos. The prices are extremel reasonable. If you like Thai food or are experimenting with it for the first time then this is a good place to eat. Thai people eat here which is always a good sign. The breakfast is advertised at 99 Baht. For this there are two fried eggs, two sausages, two slices of decent bacon and a choice of beans or tomatoes. There is also a choice of tea or coffee. (I went for the beans and the tea). There was also two slices of toast with butter and jam. I was very happy with this meal. It was tasty and well cooked. I liked the fact that I had a butter knife. A small point I know but an attention to detail that so many other places miss. I also had a choice of milk or creamer for my tea. There was free filtered water on the table. Again it may not seem a big deal but at any of the other places I have reviewed would only have bottled water and charge accordingly. Nice staff, a little overworked and the service a touch slow but it was well worth waiting. The Billabong Hotel is located on LK Metro. LK Metro can be enterered either from Soi Bukhao or Soi Diana. The Billabong is easily found. It is the point of the 'elbow' of this right angled shaped road. This breakfast is only available on Thursday and Sunday. Nonetheless it is substantial and worth seeking out. A big plus is that the location is quite quiet on a morning. The open sided eating area catches the breeze from two sides making it a pleasant place to sit and eat. The breakfast is available all day and described as the 'Big Aussie Breakfast'. 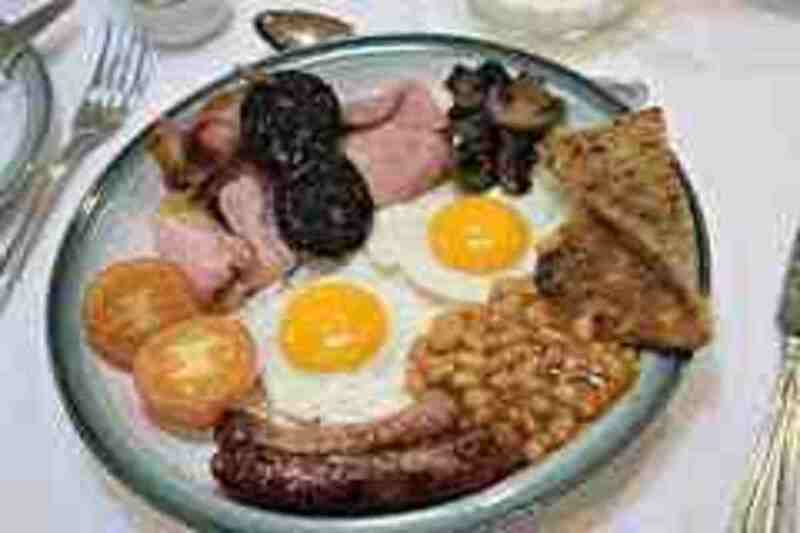 Terminology apart this is a full English. 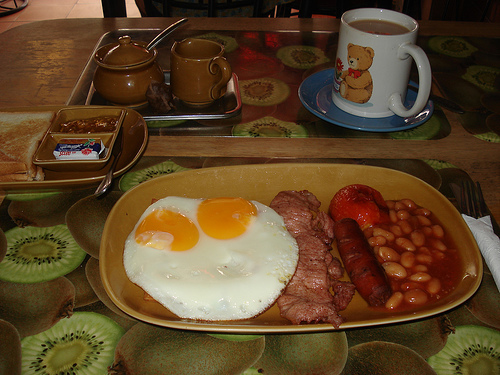 The breakast offers a choice of Tea or Coffee and Beans or Tomatoes. I went for the Tea and the Tomatoes. The meal consisted of a 'hash brown', a slice of buttered toast, two eggs, a large and tasty sausage, a rasher of bacon (sadly this was smoked and I don't like smoked bacon) two and tomatoes. There was a glass of orange juice alongside the tea. There was an additional plate of fresh watermelon and pineapple to finish off. All in all a very good deal. The price increase is fairly recent having shot up from 99 Baht to 100 Baht. A sign of the times. Sixty yards along Soi Bukhao is Rabbi's Elephant Bar and Guesthouse. I had only been here once before to an evening party. An open fronted fan establishment. Very clean place with friendly helpful staff. I liked the fact that they had copies of the Bangkok post here for reading. There was one Australian paper too. This breakfast is advertised as a 'Big Aussie Breakfast' and has increased in price since my last visit from 100 Baht to 110 Baht and has lost the glass of orange juice as an included item. There are several breakfasts on offer and the 'Big Aussie' is made up of a lot of choices. The customer makes a choice of items to make up the meal, Tea or Coffee, Beef or Pork sausages, Beans or Spaghetti and so on. My order consisted of 2 fried eggs, 2 rashers of crispy bacon, 2 large tasty sausages, beans, french fries, toast with butter and both strawberry jam and marmalade. This was accompanied by a mug of tea. All the breakfasts had something going for them. There wasn't one which I would not go back and eat again. I could go on but I have described seven here, one for each day of the week. If I have overlooked one, got to be under 100 Baht remember, let me know in comments below and I will visit. 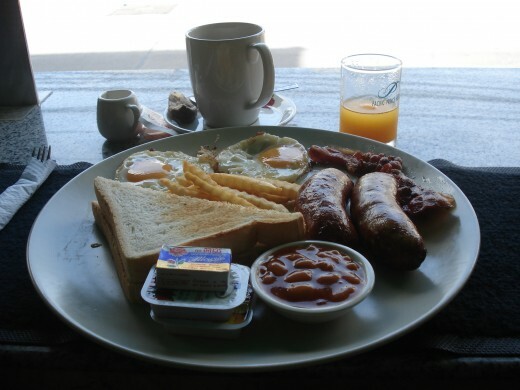 The Full English Breakfast- Health Hazard or Nutritious Meal In One? Would love to try some of these restaurants. Insightful Thanks for sharing. 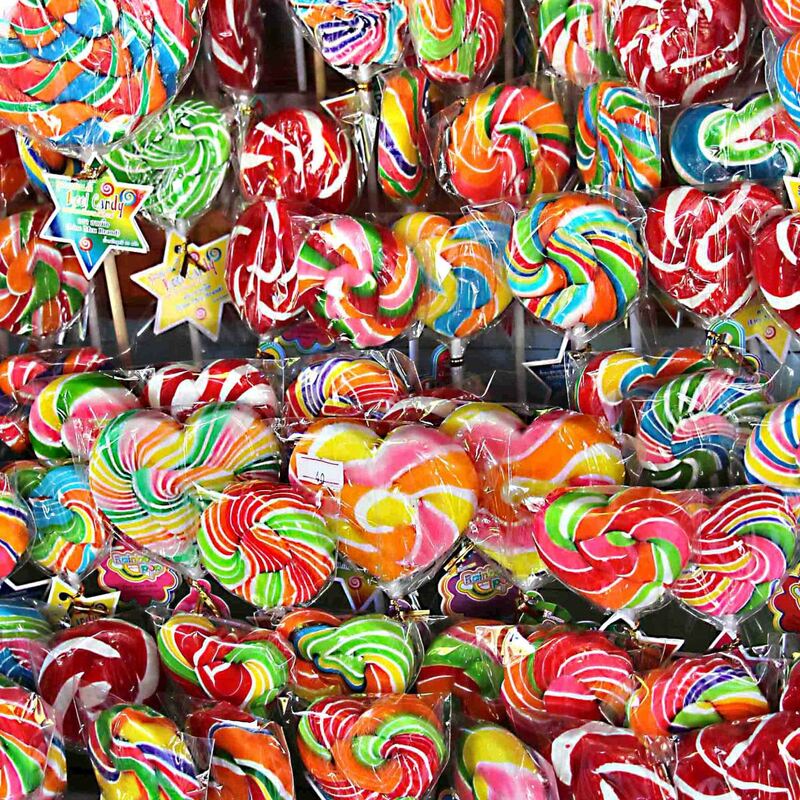 Useful and colorful hub which actually made me to salivate. Thanks Rabbi, I plan to get round to revising the hub in around three or four months time and so will drop in and see you then. I did pass by a few times last week but I did not have time to stop and eat. It seems that you did this report some time ago and I have only just been advised of it. May I say a sincere thank you from my wife and myself and if you are around I would like to meet you. We have recently revised our full menu and I would be only too happy to send you an electronic copy if you want. This just made me very hungry! This would be a huge treat for me because I need to watch the heart. Don't forget the coffee! Bucky - I have not approved your comment because it was both rude and insulting not only to me but to the reviewed establishments. I note you have changed your name since you last commented...another one I had to deny. You entirely miss the point of the article. Please pop in and say Hi next time your in town if you have time. Thanks Jack, but research is over. I am back to very rarely eating anything other than a bowl of muesli in my room. I am always still full of Thai food from the night before. I read your comments on the various eateries in the area near Crazy Daves, I will be there in Pattaya for the whole of November and I shall certainly be trying some of them that you visited. Canterbury Tales interests me and I will deffinately give it a whirl. I have eaten many times in the past at Crazy Daves. I enjoyed reading your comments keep up the good work. Maybe I will bump into you on one my visits to the eateries there. Thanks Paul - The ex pat scene is a bit mixed around Pattaya and so you will find enclaves located all over. For the budget concious Brit you cannot go far wrong on Soi Bukhao and its off shoot streets. In fact you really don't need to go very far for anything. Enjoyed this review. Have only visited Pattaya twice, but my friends and i will be back for 3 weeks from October 22nd 2009. We only visited soi buakaow twice, once for a market and the other looking for an optician. Looks like this is the place for breakfast ! Would i be right in thinking that this area is where ex pats, those in the know etc hang out ? Since I wrote this I must have seen at least two dozen other places with 'under 100 baht'. 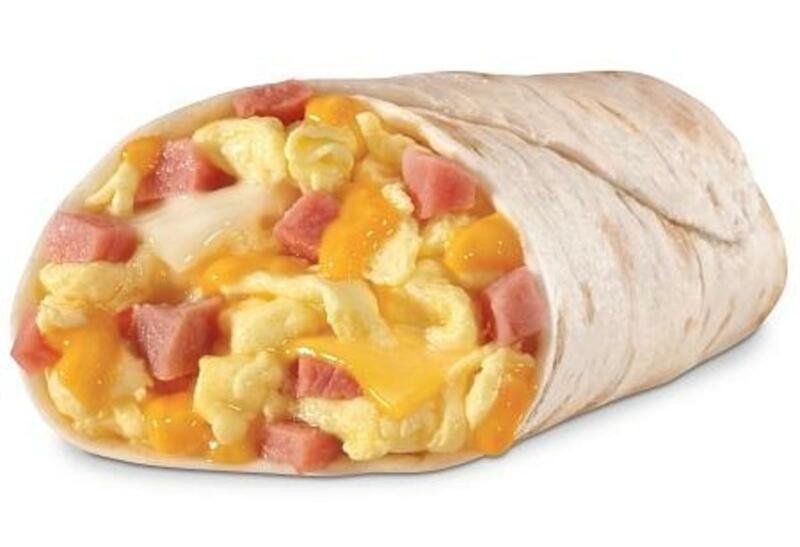 I must get into a breakfast frame of mind and go for part 2. If I can afford it I will go for 150 and under...maybe. Then I can compare value to the 100 Baht and under. I've eaten at Seaside and Crazy Dave's as well. 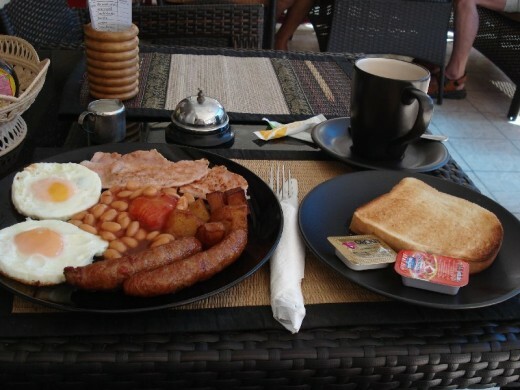 The quality of their English breakfast is very good and I enjoy it usually alone because my friends rather eat at the Lek Hotel all you can eat breakfast. Hopefully I can convince them to sit down and have a nice quality English breakfast at some of the other places you suggest. Thanks Dave. I have actually eaten at your place a time or three and cannot knock it. I limited my review to a set number otherwise it would be a very long document and stuck to the all for under 100 Baht. Maybe I should re-vist. The Diana Millenium is presently closed so I need to fill the space. We all do our bit and have regular followers and it is always interesting to read comments from anywhere, we have a competitive breakfast at Canterbury Tales Cafe as well as rooms and the bookshop so I am not complaing we were not part of the review as we probably have more bums on seats per day than any of the above, that is partly due to the great bunch of guys we have in everyday and there is always something new to chat about, its like our own little breakfast Forum and quite a few newbies have found good advice here. I stay and eat breakfast at Canterbury Tales Cafe & Bookshop. The rooms are good quality and excellent value, free wifi, etc, best breakfast in the area by far, the massive bookshop is a must for the reading matter on the beach 7 I have found it the cheapest best selection in Pattaya. Funnily enough hot dog type sausage appear more regularily in 'English type' breakfasts than one would like, even in the UK. For some reason Poms in Pattaya think baked beans are a must. I always order without even if included in the price. Also surely you have to take Diana Millenium House Breakfast off as it has hot dogs. How can that be part of an English breakfast? 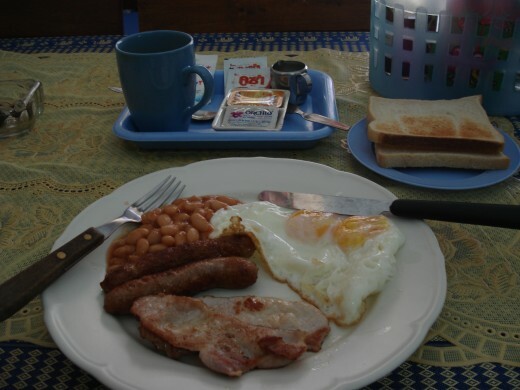 Never had beans on any breakfast I made at home (when I had one) but they have accompanied every breakfast I have had in a B &amp; B or 'greasy spoon' I have ever visited in the UK. With regards to price it was 100 Baht or under and must include Tea or Coffee in the price. Only the Butchers Arms failed to include a drink but I included it because the meal was substantial. 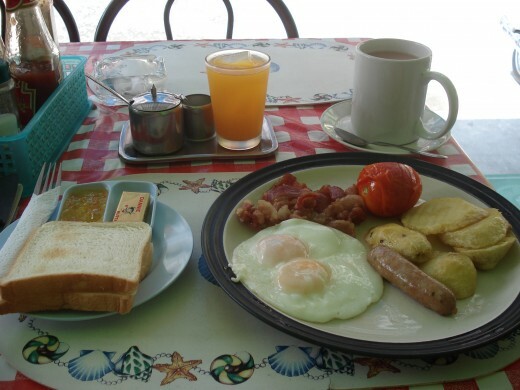 Cheapest 'English Type' breakfast I found in Pattaya is 48 Baht (including drink) and it wasn't bad. Above that 78 Baht and that was quite good too. Think you can take at least one of 5 of them off then. Normal Canterbury tales breakfast is 90 baht. Do you think baked beans is part of a proper English breakfast? Fondles - Yes I have eaten at Canterbury Tales before and it is good. I had decided on just the seven though so I had to give so many a miss. 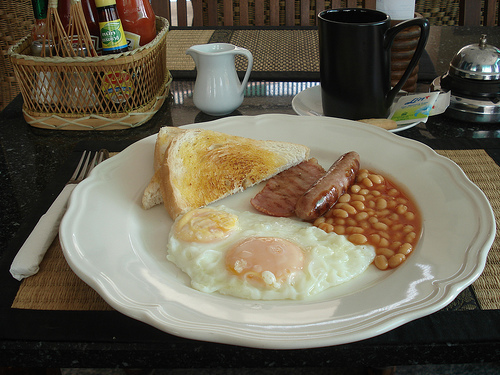 I don't doubt that the king of English 'type' breakfasts is out there somewhere...but it has to be under 100 Baht. Breakfast Boy &ndash; Actually I am pleased that you have written again. Yes I can take constructive criticism (that is how you spell it). I deleted your previous post because it was rude, vulgar and offensive. This one is only slightly better. You seem to miss the point of the review altogether. Seven days at 100 Baht or less per day. I somehow doubt you have actually read my review. To answer your previous question&hellip;No I am not American but English to the core and I am not the sort of Englishman to punctuate my writing or speech with bad language. I respect your point of view. You are entitled to it&hellip;but then I am entitled to mine too. You missed Canterbury Tales, near Crazies. The best lip smacking value breakie in that area. What's wrong, can you not take critism of you breakfast quide? You guide is rubbish and has probably the worst eateries in Pattaya, PERIOD!